ARIA! Black, Blue and Green Girls' Gymnastics Leotard with Rhinestones- FREE SHIPPING and Free Scrunchie! Click the button below to add the ARIA! Black, Blue and Green Girls' Gymnastics Leotard with Rhinestones- FREE SHIPPING and Free Scrunchie! to your wish list. Introducing the Aria girls' gymnastics leotard! This breathtaking, high-energy gymnastics leotard is guaranteed to turn heads at the gym and on the podium. 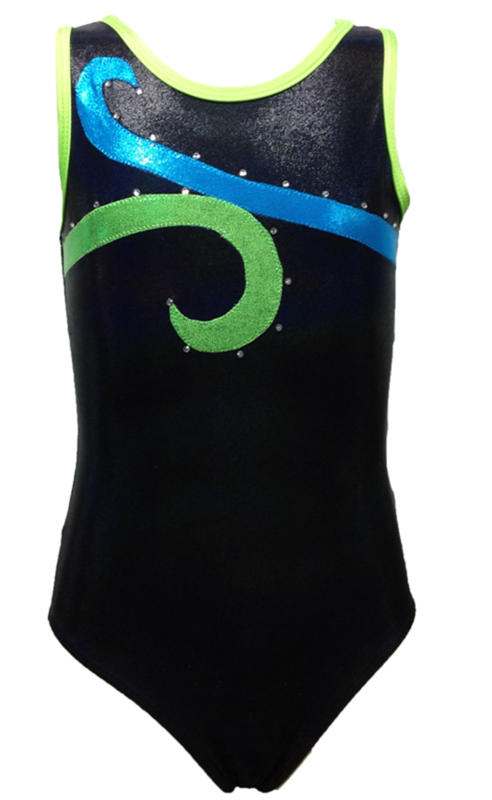 Striking rhinestone detailing set against black fabric with blue and green swirls give this one-of-a-kind gymnastics leotard its unique, eye-catching look. This statement-making leotard is meticulously crafted and designed to meet the highest quality and performance standards. Each leotard provides a superior level of comfort and durability. Every genuine Aria girls' gymnastics leotard is hand-sewn in the USA featuring rich craftsmanship and precision detailing. The eye-popping design of this exquisite leotard will give every champion gymnast an unbeatable combination of confidence, comfort and style. Work out in comfort. Compete with grace and elegance. Order your new Aria gymnastics leotard today! Black, blue and green with beautiful rhinestones! BLACK MAGIC! Black Girls' Gymnastics Leotard with Rhinestones- FREE SHIPPING and Free Scrunchie! PARTY PENGUIN! Girls Gymnastics Leotard: Adorable Black and White Penguin with Red Sequined Bow Tie - FREE SHIPPING and Scrunchie!